Nvidia makes a big deal of its tegra K1 chipset as impossibly advanced and having the most advanced mobile graphics and is so determined to improve it that it launched a 64-bit version a few days ago. It just so happens that we have the first tablet to commercially carry the non-64-bit Tegra K1 – the Xiaomi Mi Pad 7.9 and naturally we wanted to focus on the K1 benchmarking prowess. Check the very impressive results after the break. The first tests are GeekBench 3, Basemark OS II and AnTuTu 4. All test the CPU as well as the system (read-write speed, the lot). The Tegra K1 has four Cortex-A15 cores clocked as high as 2.22GHz, which is very high. There’s a third-generation battery-saver core but that one doesn’ty play a role in our testing. The chipset uses a 28nm process, which should allow the chipset to be power-efficient. The Snapdragon 800, 801 and 805 are all 28nm while the Snapdragon 808 is built around 20nm but hasn’t made an appearance on any device yet. Geekbench 3 outs the Tegra K1 in first place, ahead of the Exynos 5 Octa 5430, which we’ve found to be a formidable force thus far. AnTuTu 4 also gives the nod to the Tegra K1 over the closest device being the Exynos-powered Galaxy Alpha. The Snapdragon 801 inside the Samsung Galaxy S5 lags far behind in both tests. Finally we have Basemark OS II which tests both single and multi-core CPU performance and gives an all-round chipset score. The latter shows the Tegra K1 inside the Xiaomi Mi Pad 7.9 as the best performer out of the elite company but single and multi-core show its CPU to be far less impressive. Now for the Tegra K1′s forte – graphics. The GPU inside the K1 is built on the Nvidia Kepler architecture, which powers some very high-end desktop cards. It supports DirectX 11, OpenGL 4.4 and can run the Unreal Engine 4. The GPU has 192 Nvidia Cuda cores and supports display resolutions of up to UHD resolution (that’s 3840 x 2160 or 4K in laymans). The Tegra K1 chipset has the most pedigree here and should have superior performance to its competition and it does. Gaming graphics benchmark Basemark X shows a score twice as high as any of the competition. GFXBench’s onscreen and offscreen T-Rex 1080p and more-intensive Manhattan 1080 tests give an almost unanimous lead for the Kepler architecture and 192 cores of the K1. Onscreen tests show only the Galaxy Alpha to be the best performer and even then the two devices are close. The Alpha runs on 720p while the Xiaomi Mi Pad 7.9 has a 1536 x 2048 resolution (or 1536p – or twice) so it’s natural for the Samsung device to have the edge. The oscreen tests show the raw processing power of the GPUs and the Tegra K1 beats the Adreno 330 by a huge margin on T-Rex and twice as good on Manhattan. The GPU inside the Apple A7 chip doesn’t have a chance in this battle. The Tegra K1 is the first device we’ve tested that shows an almost stutter-free Manhattan test with 27.3fps – that’s as close to a fluid 30fps as a mobile device has gotten so far. Nvidia really has something special on its hands. 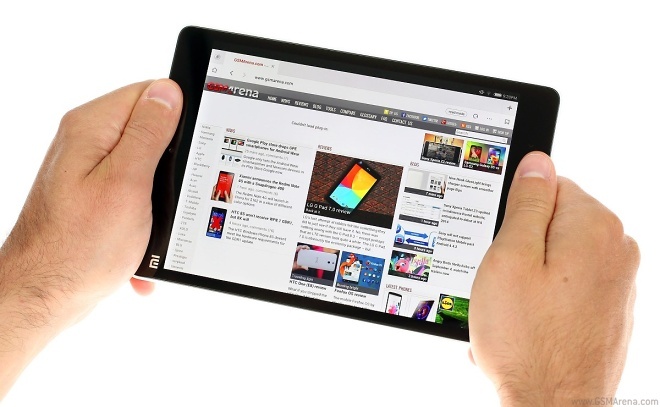 The Tegra K1 shows very powerful processing and even more impressive graphics performance. It blows most of its current competition out of the water and it makes us yearn to see what the 64-bit chip can do. It also makes us wonder why this device is still so hard to find. One thing we have to note is that the Xiaomi Mi Pad 7.9 heated up pretty badly. This could just be an issue with the tablet’s hardware not managing to distribute heat efficiently, but the chipset certainly plays its role here. 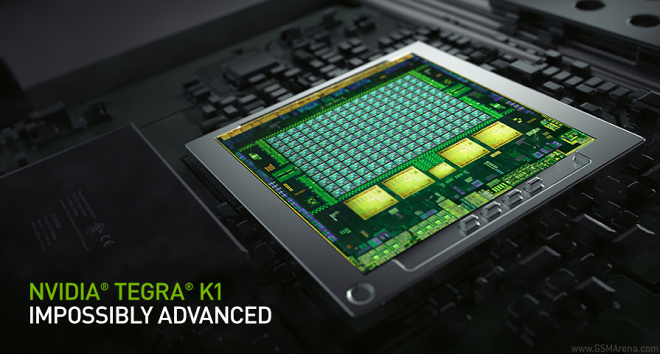 Nvidia’s Tegra K1 opens up a world of possibility for developers and mobile gamers. It puts the so-called “next-gen” consoles at a risk and maybe it will even go as far as to match them. Until then we’ll have to see what Nvidia does with this great powerhouse.